1. 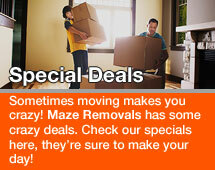 These terms and conditions form the basis of the contract between us, Maze Removals and you the customer. It defines and sets out the rights, obligations, and responsibilities of both you and us under this contract. It is a legally binding contract and so it is important that both parties know where they stand. It does include provisions that limit our responsibilities and potential liability to you. We specifically draw your attention to these. 2. Where we use the word “you” or “your” it means the customer; “we”, “us” or “our” means us as named above. Where we use the word “goods” this refers to the items that are to be subject to the removal or storage, pursuant to this contract. 3. It is important that you read and understand the terms and conditions that will apply to this contract. If there is anything that you do not understand or do not wish to agree to, then please discuss it with us. Upon receipt of these terms and conditions and your booking reference you are deemed to have accepted the terms This will form a legally binding contract between you and us. That contract will be subject to these terms and conditions.. Only enter into this contract if you wish to be bound by the terms and conditions set out below. (b) are duly authorised by the owner or owners of the goods to enter into this contract on these terms and conditions for and on behalf of the owner(s). (b) the statement at clause 4 not being true. 6. 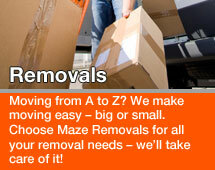 We will happily remove and store most items that you may wish to submit for removal or storage. (h) Any goods that are potentially dangerous, explosive or otherwise liable to cause damage. This includes, but is not limited to, firearms, ammunition, paints, aerosols, gas bottles and canisters; (all paint containers must be declared so as to prevent spillage and contamination of your other items, in the event they are loaded in our vans intentionally or by mistake and they open up while in transit or loading/offloading we accept no responsibility to any damages that may be caused by the paint). (k) Any collections of stamps, coins or other similar collectable items. 7. If you intend to submit any such items for removal or storage you must declare this to us in advance of the removal or storage being undertaken. In such circumstances we shall not be obliged to remove or store the items in question unless we have confirmed in writing that we are willing to do so. If we do agree to remove or store the items in question we shall be entitled to charge extra in respect of the same. If you are not happy with the extra charge levied then you shall be entitled to terminate this contract, before the removal or storage commences. 8. If we do agree to accept such items for removal or storage then we shall not be liable for any loss or damage that occurs due to the special nature or sensitivities of the goods involved. Other than this exclusion we remain liable for other losses as we would under the balance of this contract. 9. If such items are removed or stored by us without our knowledge and written agreement to do so then we shall not be liable for any loss or damage to those items whatsoever including but not limited to that occurring due to the special nature or sensitivities of the goods involved. Furthermore in such circumstances you shall be responsible for any losses, expenses, or other costs incurred by us which are caused by the special nature of the items in question, such as but not limited to clean up costs and damage to other goods. (d) store them, if the contract provides for them to be stored. We shall at all times care for the goods whilst they are in our custody and control showing all reasonable care in the circumstances. We furthermore will endeavour to act and undertake our obligations at all times in a professional manner. 11. We shall only remove or deliver items into a loft, or similar space, if it is safe, which shall include but shall not be limited to being adequately lit and floored, and the access to it being safe. 12. We hold insurance, with a specialist insurer, to cover our potential liability to you for loss or damage to your goods or for losses arising from delay upto the level of liability under this contract. The insurance is subject to terms and policy excess. If you would like more detail as to the level of insurance we hold we would be delighted to refer you to our insurance brokers who will discuss the level of cover provided with you. 14. Our staff are not authorised or qualified to carry out such work. We recommend that a proper qualified person be separately employed by you to carry out these services. 15. We do not arrange insurance to cover your goods. We are unable to offer this service due to FSA regulation on the sale of insurance. 16. All quotations are made with best intention and any estimates of how long a job will take, and hence the costs, are estimates only. You are liable for the full time that you use the service. iii) the number of people to assist with the move has varied without prior notification. 17. The quotation will remain open for a period of 28 days from the date of the quotation. After then it shall be treated as having been automatically withdrawn. 18. Upon receipt of these terms and conditions and your booking reference you are deemed to have accepted the terms This will form a legally binding contract between you and us. That contract will be subject to these terms and conditions. 19. If you make any amendment to the quotation when returning it to us then this will not act as an acceptance of the quotation. However if we decide to go ahead with the removal or storage, subject to the amendment then it will still be subject to a contract on these terms and conditions. However where you seek to amend the quotation we shall also be able to reject the alterations and not undertake the work for you, or to re-quote for it subject to your proposed amendments. (j) the total value of the goods being in excess of £20,000. 21. If the removal or storage does include any of the matters set out at clause 20, and the quotation was not adjusted to take these into account, then you will pay to us the extra costs and expenses incurred because of the effect of those matters. 22.The quotation shall not under any circumstances include a charge for arranging or otherwise procuring insurance over the goods themselves during the removal or storage. 24. Under the terms and conditions of this contract we have assumed that the value of the goods submitted for removal or storage does not exceed £20,000. Accordingly unless a higher limit is declared our liability to you under this contract for loss and/or damage to the goods shall be limited to a total of £20,000. 25. However, we do not know the value of the goods to be submitted for removal and/or storage. We are giving you the chance to discuss and agree different amounts from that set out at clause 24. If the goods are worth more than a total of £20,000 we ask that you tell us and declare the actual value to us as soon as possible. 26. Subject to an increase in the quotation and/or price being agreed, if applicable, and to our written consent to the increased value applying we will uplift our total potential liability for loss and/or damage to the goods under this contract from £20,000 to the value you have declared. provided we will be entitled to assume that you have duly received any communication from us. 29. If you wish for your goods to be insured whilst being removed or stored you must arrange this. We cannot arrange such insurance due to FSA Regulation. However, we do maintain insurance of our own to cover our potential liability to you for loss and/or damage to your goods or for losses arising from delay upto the level of liability under this contract. lose will depend on when the cancellation and/or postponement occurs. 36. 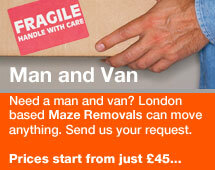 You will pay for all removal services on completion of the services on that day unless previously agreed otherwise. Whilst we always endeavor to park legally if we cannot then it is a condition of our contract that you make an immediate payment to the driver of £60 (£100 if our vehicle is required to stop on a Red Route ). If a ticket is not received this payment will be immediately refunded to you when the job is completed. If a ticket is received the deposit will be forfeit. This payment is wholly for the paying of parking charges NOT as whole or part payment of the moving charges. If the offence is on a red route then the payment will be retained because we WILL receive a ticket through the post. Payment of any other parking charges (pay and display, meters etc) will also be your responsibility. the base rate of Royal Bank of Scotland plc. 41. This does not however affect our responsibilities under this contract to take care of your goods and to provide the services within the appropriate timescales. whilst they are in our custody and control under the terms and conditions of this contract. goods lost or damaged beyond repair, as defined by clause 23, above. amount that the goods have reduced in value, if at all, because of the repair. the item in question, as defined by clause 23 above. of a pair or set. during the normal course of loading and unloading. (e) We shall not be responsible for damage to any furniture that has been dismantled and not correctly wrapped in protective material. This includes all forms of flat packs. It is the customers responsibility to make sure all furniture and appliances are correctly protected to safe guard against scratches or dents or damage while in transit. removed or stored entirely at your risk. clause 6 then our liability for loss and damage to them shall be limited as set out in clause 8.
indemnify or compensate you in respect of any costs or losses arising from delay. and conditions and at your expense. manner instructed will inevitably cause damage. submitted for removal or storage, where such damage arises due to negligence on our part. noted on the worksheet or delivery receipt. is agreed by us in writing. We will not unreasonably refuse to grant such an extension of time. amount after deducting the cost of selling the goods. promise or claim made please refer to us for clarification. removed. The publication of such notice shall be accepted as valid communication with you. confirmed in writing by us. We will not unreasonably refuse to grant such an extension of time. rates. The new rates will apply from the end of that 2 month period. entirely at your risk and we will have no liability in respect of the same. 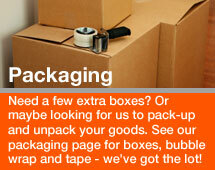 goods being properly checked by you on delivery or handing over to you or your representative. seizure or removal occurs due to our negligence.